Captain Claude Giroux answers questions about the team's future Sunday at the Flyers' practice facility in Voorhees. They say the definition of insanity is repeating the same (dumb) thing. Sort of like the Flyers and slow starts to seasons and games. You know the drill: Start the season slowly. Fall behind early in a majority of games. Stage a furious second-half rally. Barely miss the playoffs -- or barely make them but expend so much energy getting there that there is nothing left in the tank. That’s been the Flyers’ way the last several seasons, including this one. They finished their season 37-37-8, sixth in the eight-team Metropolitan Division, and missed the playoffs for the fourth time in the last seven years. They accumulated just 82 points, their lowest total since 2006-07, and finished with a goal-differential of minus-37. In the Year of Eight Goalies, they allowed the first goal in 50 of their 82 games. Worse – much worse – is they fell behind, 2-0, in 32 of their 82 games (39 percent). They won just four of those 32 games. 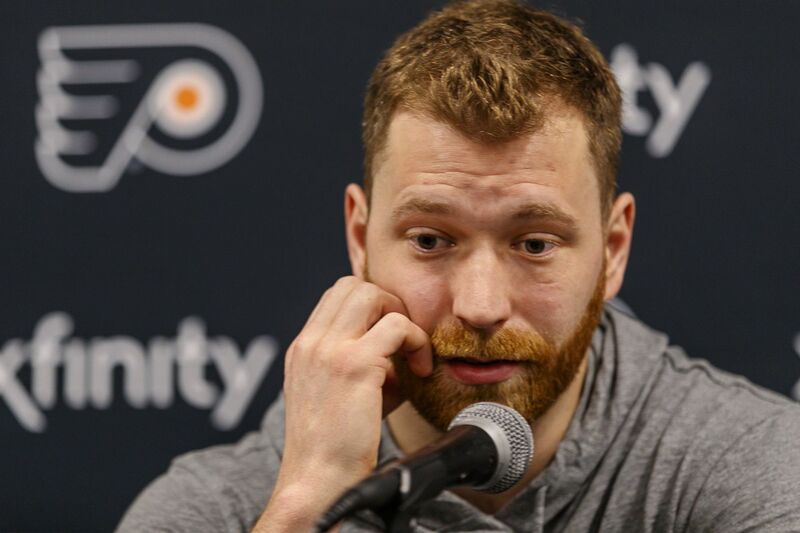 The Flyers -- led by Sean Couturier, Jake Voracek, Claude Giroux and James van Riemsdyk -- accumulated just 82 points, their lowest total since 2006-07, and finished with a goal-differential of minus-37. “As players, we have to take responsibility to be ready every night,” left winger James van Riemsdyk said after the Flyers cleared out their lockers at their Voorhees practice facilities and met with the team’s brass and the media Sunday. After a 5-3 loss in Washington on Jan. 8, the Flyers had just 15 wins and 28 losses (15-22-6) and, for all intents and purposes, were cooked. The next night, they were last in the 31-team NHL with 36 points. Van Riemsdyk, who finished with 27 goals, repeated an all-too-familiar line from the players in recent seasons. Nolan Patrick, a 20-year-old center who has been up and down in his first two seasons, said he didn’t know the reasons for the Flyers’ slow starts. Having goalie Carter Hart for a full season could help the Flyers get off to a much better start in 2019-20. “I think he’s going to be a top goalie in the league,” captain Claude Giroux said. Having Carter Hart for a full season should help the Flyers. Giroux, whose team was outscored by a 94-63 first-period margin, said it took the Flyers too long to get into a game’s flow this season. Was that because the coaches didn’t have them prepared at the start of games? Many of the Flyers were asked if they thought general manager Chuck Fletcher needed to bring in new players because the current group had become stale and had repeatedly chased games. That, too, has been a familiar refrain in recent years, but the fact is the Flyers haven’t won a playoff series since 2012. That makes most observers believe Fletcher, who has plenty of cap space, will make some major offseason moves.